We live in an age of fragmentation: fragmented communities, fragmented lives, fragmented attention. Our ADHD world seems to pull us in many directions all at once, and the strain of multitasking our entire lives can leave us feeling exhausted, alienated, and dissatisfied. Eventually we pause and wonder, "What's the point of it all?" We long for a coherent life that is connected, meaningful, and whole -- in a word, we seek Integration. Ann Betz is co-author of a book about integration -- what it means and how to achieve it -- titled Integration: Being Co-Active in Work and Life. I interviewed her about what each of us can do to become better integrated. Question: What does Integration look like in someone's life? That's the big question! Bottom line, integration means taking the disparate parts of ourselves and finding a way to honor all of what we are. Mostly, we divide ourselves into "either/or" choices because it's less complex. For example, in my family my choice was to either tone my natural exuberance down, or risk disapproval. As adults, many of us decide that we can either meet our desire for security and stability, or we can have creativity and adventure. In relationships, we are taught that it's all about compromise, with someone needing to give up their own needs and desires. When someone does manage to figure out how to have everything without sacrificing parts of themselves we tend to see them as tremendously fortunate, rather than intentional. What we are proposing in this book is that the road map to fulfillment and effectiveness is to stop living in the either/or paradigm, whether within ourselves or with others, and instead, stand in the challenge and discomfort of integration. Question: "Being Co-active" - what does that mean? Answer: "Being Co-Active" is another way of saying "being integrated." It's a way of operating that includes aspects of both being and doing. Co is all about relationship, meaning, values, space and vision (and correlates more to the right hemisphere of the brain) while Active is about focus, intention, step by step activity, and moving things forward (and correlates a bit more to the left hemisphere of the brain). The hyphen is integration, and in that sense, being Co-Active means holding both. 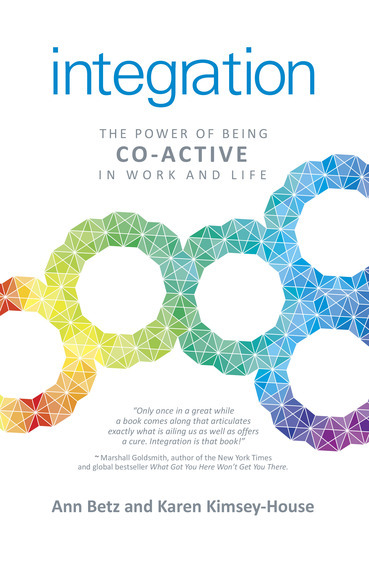 Co-Active started as a theory of coaching, but what we explore in the book is how this theory and its practices and tools can help everyone lead more integrated lives. Question: You and your co-author Karen Kimsey-House are leaders in the CTI coaching network - the largest such network in the world. How do CTI coaches work with people to help them achieve greater integration in their work and lives? Answer: We use the Co-Active model, which we go through in detail within the book. For example, a part of the model is our commitment to "deepen the learning and forward the action." This means that when a client comes to us with a topic or issue, we don't just jump in and immediately focus on what they can do about it. Instead, we explore what's important and meaningful by being authentically curious and listening to everything they are saying (as well as what they are not saying). In this process, by not moving too quickly to action, the client has a chance to find larger, better and more creative solutions sourced by their own values, purpose and vision. And then we work with them to move these solutions forward in specific ways, providing ongoing accountability. This process help the client become more self-integrated because both the being and doing aspects of themselves are pulled together, and the coaching relationship is an ongoing upward spiral of learning, action, learning from that action, action from that learning, etc. We also have a commitment to see the client as naturally creative, resourceful and whole. This means we don't fix or advise. We believe everyone has the answer within. Through a process of open exploration in a non-hierarchal way, the client comes to their own conclusions. And when people do that, rather than being told what to do, they develop greater capacity for ongoing creativity when faced with difficult issues. Question: Integration draws heavily on modern neuroscience and research about the brain, especially the work of psychiatrist Dr. Daniel Siegel, who has written extensively about Integration. What are some of the insights of science that help us lead more integrated lives? Answer: Yes, we're big fans of Dan Siegel, and we use his definition of integration as one of the cornerstones of this book: integration is the linkage of differentiated parts. For us, that is one of the most interesting insights right there. We need to both differentiate - that is, know ourselves, become more aware of our own internal processes, values, talents, goals and needs, and be able to link. And by linking, we mean both internally and externally. In other words, we need to fully discover the various parts and aspects of ourselves, pulling them together in some sort of harmony. Then, from this place of greater wholeness, we can much more effectively link with others. It's a process of being both clear about who we are and permeable to others. There are many different aspects of the brain that play into this. One example is the right and left hemisphere. They see the world differently, and, in a way, want different things for us. The left wants structure and logic, while the right wants wholeness and meaning. When we can identify our own desires in each area, we can stand in the hyphen, pulling both together. This isn't just more satisfying, it's much more effective. Question: How can the ideas in your book lead us to better relationships at work and in our personal lives? Answer: I think the simplest answer is found again in Dan Siegel's definition of integration. We need to both be able to differentiate -- ourselves within ourselves, ourselves from others -- and also link. We need to know who we are in all of our full human potential, celebrating and honoring our amazing capabilities. We also need to be able to link, to hold the internal paradox of wanting both creativity and security, structure and freedom, full self-expression and connection, as well as the external paradox of knowing who we are and what we want and being available to be shaped and changed by others. None of this is particularly easy. But we believe it leads to more connected, resonant and effective lives on all levels. Ann Betz is the co-founder of BEabove Leadership, and an international expert on the intersection of neuroscience, coaching, and human transformation. Karen Kimsey-House is the co-founder of the Coaches Training Institute, the largest in-person coach training company in the world.